In an increasingly competitive manufacturing environment, businesses need flexibility, improved productivity, and the capability to make gains in efficiency and reductions in down-time. Mitsubishi Electric is showing how these requirements can be met with a focus on connected production systems, intelligent control systems, Edge Computing solutions and smart services at EMO 2017. 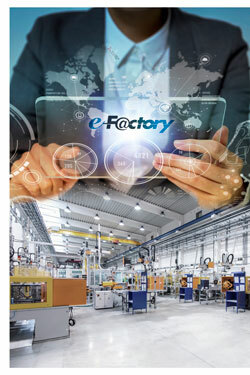 The e-F@ctory concept from Mitsubishi Electric is being used to provide a practical structure for delivering these solutions, enabling the process of digital transformation to happen at a manufacturing level. Key technologies include CNCs, PLCs and EDM machines, plus, live demonstrations aligned with partners for the challenges of today’s machine tool industries. Live examples of human and machine connected production systems show how machine builders can enable end users to gain major business benefits. Increased connectivity is helping to deliver improvements in production optimisation, monitoring, remote services and predictive maintenance. This is demonstrated by connecting the new generation of M800/M80 CNC controllers with other automation solutions on the two Mitsubishi Electric stands, as well as with the customer machines at the exhibition. Visitors will also see demonstrations of a Smart Services pilot project with the Fraunhofer Institute of Production Technology IPT featuring Human Orientated Monitoring and Training, along with a cloud-based AI Platform within IBM Watson linked to a Mitsubishi Electric robot delivering new predictive maintenance models, augmented reality and voice control. To enable all these exhibits Mitsubishi Electric is using its e-F@ctory concept, which supports the increasing digital transformation affecting businesses. Mitsubishi Electric is underlining this capability at EMO 2017, with the general theme of “e-F@ctory – pushing business further”. Having integrated all of the technologies on the stands into an IoT environment, the exhibits show how connected production can be easily achieved. Key technologies on show include Mitsubishi Electric’s new generation of CNC controllers, providing fast, precise and affordable control of machine tools for complex machining applications. The M800/M80 CNC Series offers increased processing speed for improved machining performance, with greater machine responsiveness and more accurate machining. Also on the stand is the recently launched PLC rack mounted C80 CNC CPU module. With all of these controllers Mitsubishi Electric is highlighting how businesses can benefit from integrated control over an entire production line. The seamless flow of data enables users to implement control systems, driving the optimisation of individual machines and allowing overall factory throughput to be optimised. This is illustrated on the Mitsubishi Electric stand via large screens displaying the production and operational data of all the connected machines. Key production information is also replicated on local operator terminals. Predictive maintenance is another important theme of the Mitsubishi Electric stand. In a live demonstration focused around a robot RV-4FRL, data from the robot controller – a Mitsubishi Electric CR 800 – is passed to a Mitsubishi Electric MELSEC iQ-R series PLC which provides an Edge processing layer. Pre-processed data is then passed to the cloud for analysis using the AI platform within IBM Watson. The dashboard provides an overview of robot health, and transmits maintenance requirements to an operator tablet. Users can see the efficiency of each joint of the robot, look at how that has changed over time, and view maintenance action suggestions from Watson so that efficient maintenance can be planned. Further increasing the efficiency of this maintenance, the demonstration on the Mitsubishi Electric stand includes voice control of the robot. The maintenance activities themselves are optimised through the use of smart glasses, where the operator is shown CAD drawings of the relevant robot parts superimposed over the robot itself. In addition, the glasses can show the maintenance manual and individual instructions. Another demonstration shows how smart devices such as tablets and Smart glasses are a key driver in the digital transformation of manufacturing. It gives a glimpse into the future of human orientated monitoring and training. Developed as a pilot project with the Fraunhofer Institute for Production Technology IPT, the tablets and glasses are being used as a user interface to the M850W CNC controller on a 5-axis CNC machine. For machine monitoring, operators can view up-to-date machine and production information, such as progress, remaining time, machine status or overall equipment effectiveness (OEE). Raw data is continually processed, visualised and automatically updated within the smart device, and should unexpected production interruptions or errors occur, the operator can be automatically provided with pop-up information to rectify the problem. This advanced visualisation technology supports predictive maintenance, but can also aid with training for operators or maintenance staff. As a result of this connected technology, operators can interact with machines more efficiently and learn how to use them more quickly. Users are able to choose from a menu of topics, including education, service/support, live data and predictive maintenance values. The menu items provide a mix of moving animations, guidance videos and augmented reality content.